The British Powerboat Racing Club (BPRC) has today issued Advance Programmes and Entry Forms for its Cowes Torquay Cowes and Cowes Poole Cowes races to be held on September 4th. The longest running offshore racing event in the World is now into its 56th year. The contest was the brainchild of the newspaper tycoon and second world war fighter pilot Sir Max Aitken, who had seen the Miami-Nassau Powerboat Race that began in 1956. 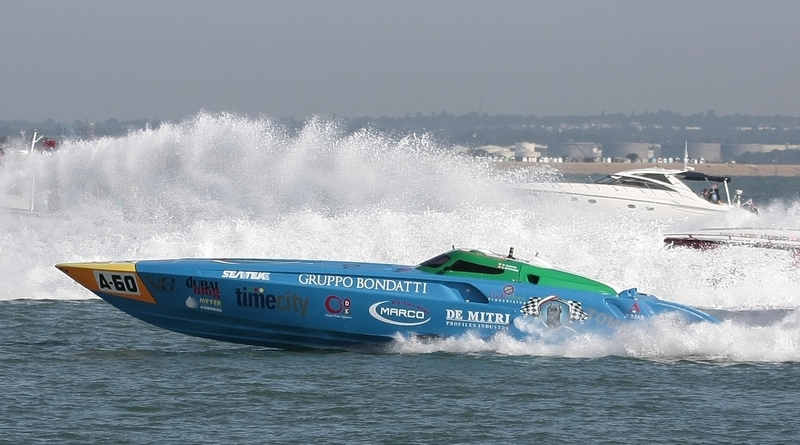 At the time, powerboat racing was a perfect fit with America’s affluent profile. It was spectacular, and offered upwardly mobile enthusiasts an opportunity to compete on level terms with their old-money counterparts. At the London Boat Show in January 1961, Sir Max proposed that a similar race should be staged in England between Cowes and Torbay. The concept gripped the public’s imagination, and there was huge interest and television coverage when the contestants set off from the Royal Yacht Squadron at 10 am on August 27th with 27 boats competing. Seven hours and 17 minutes later,Thunderbolt, a Christina-hull craft driven by the former saloon-car racer Tommy Sopwith, crossed the line in first place, having travelled at an average 24.50 mph throughout. Last year, the winner Vector Martini Rosso driven by Peter Dredge, Simon Powell, Mal Crease and David Gandy averaged the fastest course speed ever at 94.55 mph! UIM Marathon competitors can look forward to 190 nm of racing, with a stop-over at Torquay again this year, whilst National and Club boats will enjoy a ‘mini marathon’ to Poole and back. Event Director Martin Levi commented, ‘We are expecting around 17 entries in the Cowes Torquay Cowes and over that figure to take part in the Cowes Poole Cowes race. We are a little later with our entry forms this year due to making sure sufficient event insurance had been procured and funded. We are looking to welcoming competitors and spectators from far and near in September at Cowes’.